You might be wondering how to place an MVC View easily on a pop-up window like the image above that’s why you are in this page now? Well you a bit lucky as I will tell you how easy is this to execute, but first of all let me tell you that I am using the Window Control from Telerik Extensions for ASP.NET MVC to make my life easy and not re-invent the wheel and if you don’t have problems with that then read ahead. 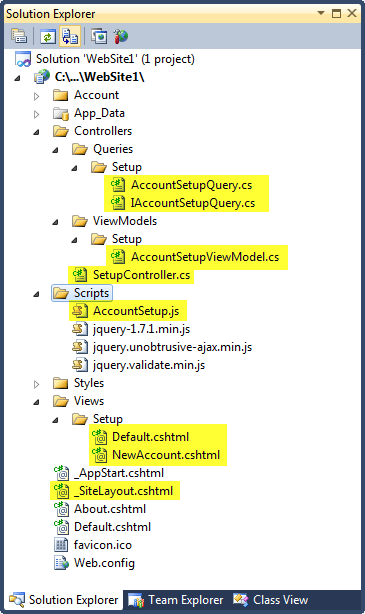 Now lets create a query to execute with firstName and lastName as a parameter and name it as GetAccountViewModel which we will place in AccountSetupQuery.cs under Controllers -> Queries -> Setup, you can also create an interface for it if you wish. This method will combine the firstName and lastName and sets the AccountName viewModel. You notice we have a method called RenderRazorViewToString, like how it’s called its purpose is to Render the MVC Razor View to string. We will be using the MVC engine to render the view model as HTML so we can easily place it on the pop-up window. You can place it in the controller but best if there is a separate class for this as you will definitely reuse this a lot. Next lets create a view and call it “NewAccount.cshtml” and place it in Views -> Setup, this is the view that we will be using on the pop-up window. which we call “AccountSetup.js” located in Scripts folder we will create a function trigger the Telerik window pop up. So for a full view on how this is structured please refer to the image below. I highlighted what was used on the codes above. how about if we would like to put submit button on the windows ? after processing by the controller will it be post all form or can we just post the part on window itself? You code is very good and I think I’ll use it to popup a windows and catch some user information. But I think I’ll need a submit button which save some data and return to the caller view. As requested previously, could you complement you code with a Submit button? If it was a login popup, I would want to be able to loging via the popup, and on success, have the popup disappear and then a redirect to occur on the main page – how would I go about achieving that? How can I reuse the same pop up window while it is displayed and update the view. I am using MVC2. I one ascx file is a teleric window which is used as pop up window. The window is displayed by AJAX. Now when the user clicks a button on that pop up window a post is done, and action method is called , and that action method is going to return loading a view. What do I do in the action method so the view is loaded into the already telerik popup window which is displayed?